This ride is Doc’s mission. For more information about his church community, please stop him on his way south along Highway 1. Doc can use a place to board his horses each night, so stop to offer your place when you see him. Today he’ll depart Pescadero to travel to Santa Cruz, then on to Monterey, and then El Sur Grande, a day’s ride southbound until San Diego, where he will then head east-northeast to D.C. Happy trails Doc. God be with you. We love and miss you in Shelter Cove. Sorry not to reply sooner. This is so terrific that folks update us as Doc moves about. I love it. Thank you everyone. I was just wondering about Doc and decided to google him. Several years ago We had the opportunity to meet Doc and his horses. He spent several days with us out here in upstate new york. He is an amazing person. God bless Doc as he travels raising awareness for starving children! He’s on Hwy 26 in Oregon Today. Terrific imagery! Thank you for the update on Doc and his steeds. I’m happy he is in the high country as summer begins. Doc spent father’s day weekend with us here is South Lake Tahoe.Saturday night a few whiskeys at Divided Sky in Myers, Father’s Day church and a backyard festival all day Sunday. Horses were well rested and two days of pasture on the Truckee river. Monday, a late start up Hwy. 89 around Emerald Bay onto Truckee. Well fed, Well rested, and Mucho Love, Doc took off to ride his most beautiful ride. We met him tonight in Newberry Springs, California in the high desert between Barstow and Baker en route to Las Vegas. Wow! We had seen him by chance on Los Osos Valley Road in February of this year, and now here he is, overnighting at a friend’s ranch on the Old Spanish Trail, along the dry Mojave River en route to Las Vegas. Godspeed!! This afternoon on my way to pick up insulin for our just diagnosed diabetic cat, I was feeling very depressed. While at a stoplight nearing my turn, a man on a horse with two others in tow passed on my right on a busy road in Kearny Mesa, CA… I had to find out what this was about! Because of traffic neither of us could stop for long… he handed me a folded piece of paper that partially told his story. I was elated to learn about his quest – making mine feel more manageable. When I got home I went online and found many resources with his name and found that he has touched many… and help keep his journey updated! Saw Doc at the Hill Street Cafe in Oceanside, CA just north of San Diego. He was eating lunch. It was very funny to see the faces of astonished passersby as he rode down the Pacific Coast Hwy. I wish him all the best! My husband and daughter got to see and speak with Doc today in San Clemente, last city before San Diego county. I sent my uncle, a local reporter, out to get his story and some pictures and hope it continues to help bring awareness. He had already passed our stable in San Juan Capistrano but I’m hoping he will be able to put up for the night at the stable on Camp Pendleton Marine Base. God bless him and his horses on their journey! Its not everyday that one meets a Hero . And not everyday, one who graces our California coastal city of Newport Beach. And even more uncommon riding horseback with two horses in tow, on one of the most traveled streets around, PCH. I caught up with the man, named Doc Mishler along with his three longtime horse companions, a family named Chief Free Spirit, Justice and Charity in a very busy Parking Lot on Balboa and PCH. He ‘s an original Lone Ranger with silver spurs on his cowboy boots and red kerchief around his neck. We sat down and shared a strong cup of coffee, chocolate chip cookie; however more importantly he shared his Story and his Mission in Life. Our hero’s name is Doc Mishler and he is on a mission to “Raise Awareness in the Hope of Ending Child Poverty in The World. ….con’t…..
Mandeville Canyon has some nice stables, maybe someone there could offer them a place. Wow Kat! Where in the heck I hope he found comfortable lodging while trekking this stretch of the urban coast. Thank you so much for the geographic check-in. Glad to hear Doc and the “kids” are in warmer places, but we sure miss them here in Humboldt County. What?! Really?! How wonderful of you to post an update. Thank you. I hope that Doc’s able to find comfy accommodations for the horses to lie down within. Saw him tie up at a bar in Moss Landing. Glad I follow your post. Allowed me to know who he was. Neat! Thanks! 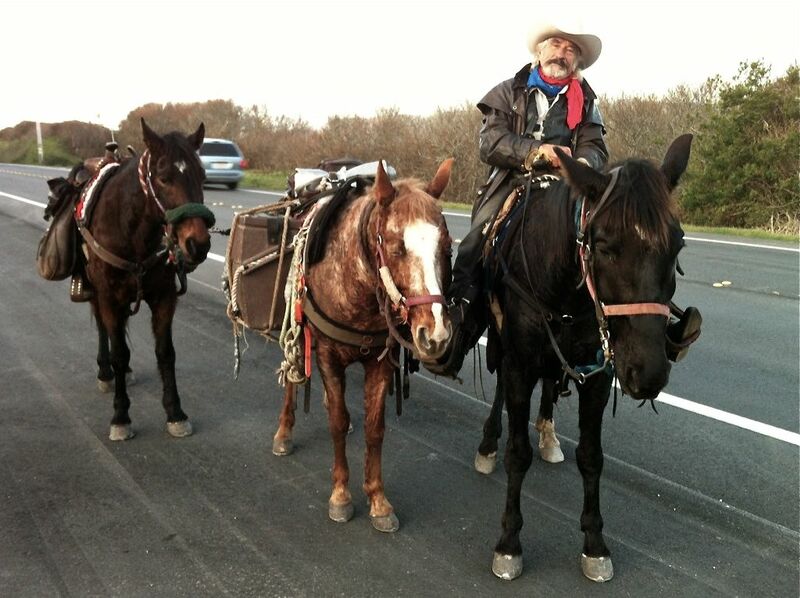 Doc Mishler is riding the Big Sur coast now! Grandma Jo and Denise, I am so glad that you wrote in. I hope others do the same, to keep us updated on Doc’s progress south. I was just out in Pescadero , He said he had to rest the horses for about a week and was heading wherever the good lord will take him. Quite a sight and I wish him all the luck. I hope all is wonderful with you and your coast road travels? Yes, I used Twitter last year. I wasn’t inspired to blog. Doc inspired me. He embodies a J. Smeaton Chase adventure! Hi you guys: I believe Doc didn’t depart Pesky today as there were no horse dookies on the coast road, such as there were every few miles between HMB and Pesky yesterday. I’m hoping that my belief is true as its quite cold and stormy tonight. I’m trying to find out who put up Doc and his three steeds. I’m her brother and will keep an eyes and ears out for him. That will be an interesting ride on Highway One through Big Sur. if he gets out Ramona way (east of San Diego), he can house his horses at my brother’s place. He has mules. Haven’t seen one of your posts for quite some time. Good to rec. this.